MEMORY ETERNAL! DEACON ROBERT POLYCARP SHERWOOD formerly of St Mark/Denver, CO and, at the time of his repose, assigned to the Church of the Glastonbury Icon of the Mother of God (ROCOR) in Hamilton, Ontario, Canada, fell asleep in Christ and was buried June 9 by FATHER JOHN CONNELY from the Basilica of St Laurence/Tallahassee Creek, CO. He is survived by his wife DIACONISSA LILLIAS to whom condolences may be sent c/o john.connely@gmail.com. 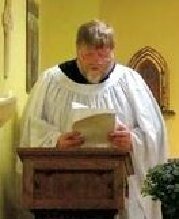 Please join me in praying a rope for the repose of Deacon Robert's soul, saying, "O Lord Jesus Christ, grant rest to the soul of Thy departed servant." May he be granted Paradise, and may you be granted long life.